Thank you to our sponsors who joined us for our quarterly Sponsor Breakfast. We had great attendance and enjoyed networking with all of you. You can now view pictures from the breakfast on our Facebook page ( Please make sure to tag yourself ). Thank you so much for all you do to help connect the community! We are starting production on our January 2018 Portland/ Vancouver guide and will be sending an email to all housing and home care to verify your grid information. Make sure to submit your changes for the upcoming guide! In addition, Meghan will be sending out ad approvals this week. The deadline to submit new artwork is November 1, 2017. Please contact us if you would like to reserve your space in the upcoming guide or update your information for the year. 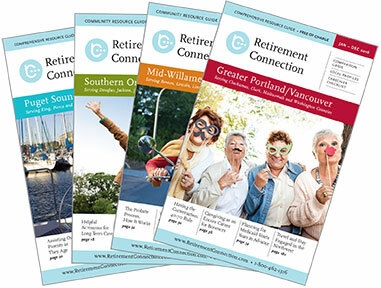 As you may have heard, the 2018 Portland/ Vancouver edition of the Retirement Connection Guide will have an LGBTQ designated column within the community housing grids that will signify which communities are now accepting LGBTQ Elders. If your community is interested in becoming SAGE certified and would like more information on how to start the process of welcoming LGBTQ Elders, please follow this link to complete a 3 step process.